From the bottom of our hearts, we would like to sincerely thank our contributors for their unwavering trust and reaffirm our ambition to deliver on our product roadmap and sales pipeline objectives. It has been an humbling experience full of high highs and low lows that we think deserve proper conclusion notes. In rather challenging market conditions, the story didn’t quite unfold as we thought it would. It required us to constantly re-evaluate the relevance of what we were doing as individuals, as a team and as a bootstrapped company that had never accepted funds until now. We have experienced first-hand the fundamental differences between an enthusiast crowd in a bull market and our ability to secure contributions during the now infamous “Cryptocurrency Winter”. Our team would like to take this opportunity to practice the transparency that we preach, and shed some light on some of the major decisions we needed to make to move forward and how they will be impacting the next chapter of the Stacktical company. It was brutal. Halfway through the DSLA token sale, in late 2018, it became apparent that many potential contributors had simply abandoned the idea of contributing to token sales. At the crossroad of increased fundraising competition and decreased interest in crowdfunding projects, it has become very capital-intensive for companies to acquire, develop and nurture token sale contributors and projects advocates. A poor execution of marketing operations in these market conditions can quickly lead to negative ROI, and many of our peers have overpaid for underperforming display and email campaigns, token sale listing, press releases, events and airdrops. In our public token metrics and expenditure forecast sheet, we had modelled our token metrics around the expectation of onboarding more than 4000 Stacktical community members, with an average contribution of 4 ETH. Today, even though hundreds of users did pledge more than 80,000.00 ETH to our sale, even if we reached a peak signup rate of 10 signups / minute at some point, and while we have successfully reached our 7,200.00 ETH soft cap, ultimately, we have only been able to convert 10% of the total commitment to actual contributions. This translates into an average of 396 ETH per contributor from 30 businesses and individuals. 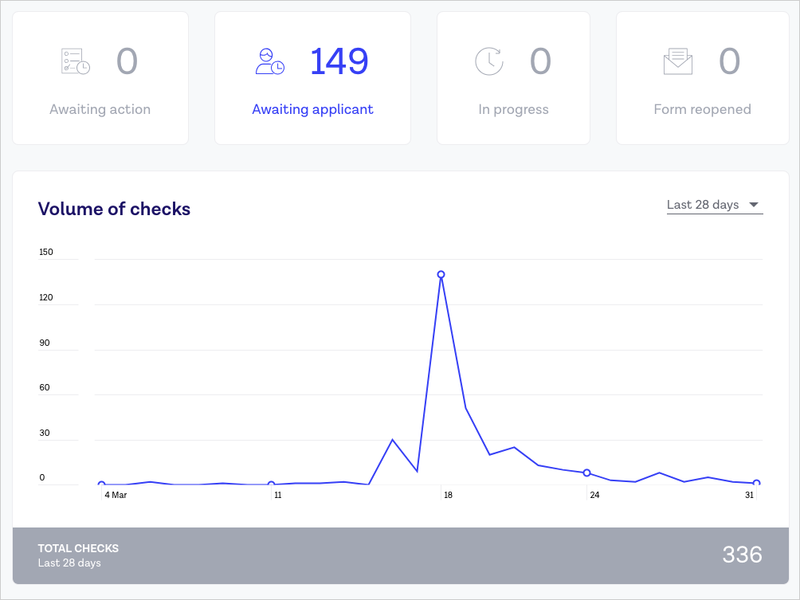 As of today, we are processing a $4.8M opportunity pipeline with more business contributors and cryptocurrency funds with strong diligence constraints, and there are still 149 applicants in our KYC backlog. As the market has started to recover, some of these businesses and individuals will be able to send their late contribution during the listing grace period (details in the last paragraph of this post). The Cryptocurrency Winter has certainly been hard on us. But we are glad to have kept our soft cap objective as a key condition to the success of the sale. It’s been a driving force for the entire team and as a performance commitment, it’s perfectly in the spirit of Service Level Agreements. In hindsight, we should have focused on onboarding businesses and enterprises from the get-go. A business-to-business only token sale that involve service providers, our target customers, would have been perfectly aligned with our DNA as a B2B company. 👉 1/ Organize an airdrop of trial DSLA tokens to the eligible businesses that did not have the time or capacity to join the sale. 👉 2/ Keep accepting more business purchases of the DSLA token until we are listed on cryptocurrency exchange. If you are the legal representative of your company, you can contact us here for purchasing enquiries. 👉 1/ All private sale contributions were to be transparently logged into the token sale smart contract, so that private contributors can be bound by the same rules than everyone else. No matter the currency used to participate to the token sale, all private contributions can be mapped to their ETH equivalent, and ensure the vested distribution of tokens and the respect of the pre-defined terms of the DSLA token sale. 👉 2/ By that same logic, we were to only accept ETH during the pre and public stages of the DSLA token sale. Ultimately, we have mostly received ETH contributions during the private sale and we ended up dealing with multiple other different currencies during all rounds. As per our token sale provisions in the Stacktical white paper, ETH proceeds from the private sale have immediately been converted to FIAT to support our ongoing operations and integrate our cash flow. As per our Simple Agreement for Future Tokens and other business agreements, proceeds in other currencies will be transferred to a set of designated wallets over the course of the year and continuously integrate our cash flow as per our operational needs. The Stacktical team is actively pursuing exchange listing opportunities. We have already received two listing pre-agreements from top tier cryptocurrency exchanges that we are not authorized to communicate about at this stage. We are hoping to make a proper 1st listing announcement by the end of April 2019 but as you might know, we have little control over the terms of the Non Disclosure Agreements we are subject to. At the end of the day, the number of DSLA token holders and the level of adoption of our utility token matter more than the count of token sale contributors. We have organized and will continue to organize multiple marketing initiatives geared toward increasing the number of DSLA token acquirers holders. Whether you’re an online consumer, a service provider or any other service stakeholder, the delay and downtime compensation experience that we are crafting will be relying on staking DSLA tokens in a wide variety of scenarios. We remain committed to keep driving the adoption of DSLA and improve its utility in our decentralized economy. 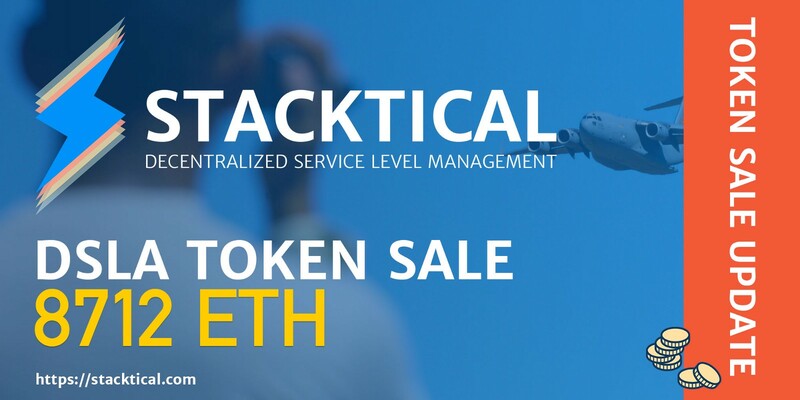 As the Stacktical is project is garnering interest, it would be a shame to just prevent interested parties to purchase DSLA tokens. As discussed before with the Stacktical community, we ultimately plan on burning unsold token that are not acquired during the listing grace period. We’re in this for the technology. In April 2019, we will unveil the DSLA Network Platform to the general public, on the Ethereum Ropsten test network. 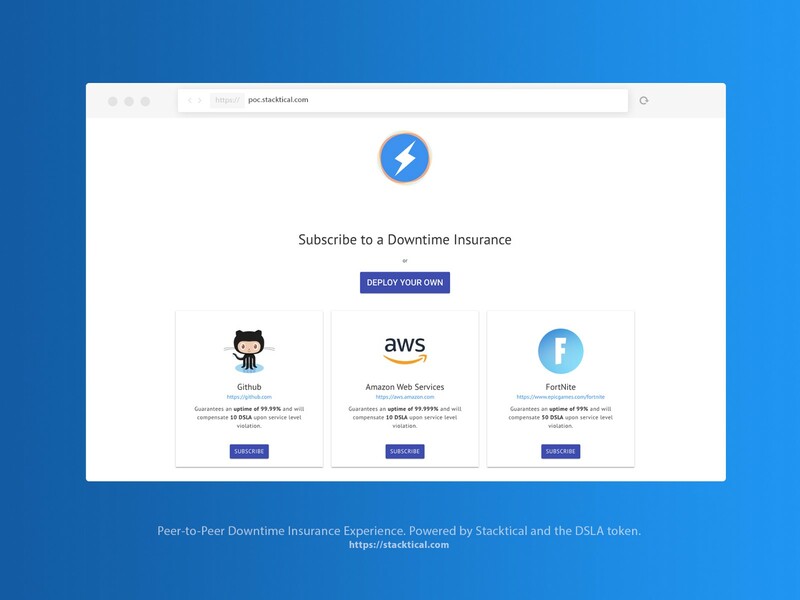 Armed with your (test) DSLA tokens, you will be able to join and create Decentralized Downtime Compensation programs in just a few clicks, and watch the blockchain magic operate as online services go up and down. Thank you for your continued support, it is just the beginning of a revolutionary journey.